Welcome to our new Librarian Bonnie Brotherton! 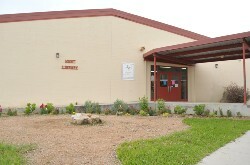 The Myrtle Higginbotham Hunt Library of the Brackett Independent School District strives to be an essential part of the instructional program assisting students and staff in becoming effective users of information to develop life-long learning and to promote a love of reading. Reading is a joy, a privilege, and the right of every student. As you select the library books you will read, please understand that every book is not the best choice for every student. If a book is unappealing or offensive to you in any way, please return it and select another. You, the student, know better than we, the library staff, what reading materials best serve you and your standards and beliefs. Students may check out one book for a period of two weeks. The majority of books can be renewed for an additional two weeks with the exception of books in high demand. Fines for overdue books will be charged at the rate of .05/day (excluding holidays, weekends and excused absences). Fines must be paid before the student will be allowed to check out another book. Books that are damaged and/or lost must be replaced or paid for before further checkouts will be permitted. Students in grades PK-6 must choose books from the "Elementary" section only. Students in grades 7-12 must choose books only from the "Secondary" section of the library. Use quiet voices and be respectful. No food, gum or drinks in the library. Proper dress code and appropriate language are expected. Student Code of Conduct will be enforced.